I learned a technique in Adobe Flash that involves cutting a hole in an object. A similar concept is called masks, which creates a transparent area in an object. Then you place something behind the hole and animate the object with the hole (or transparent area), to reveal what’s behind it. Here’s an example done in Flash. You have to scroll down to see the animation. The text is behind a rectangle that has an oval transparent spot. As the oval mask moves, you see the underlying text. You can do lots of cool things with this type of technique, and for a while, I’ve been pondering how to create a mask in PowerPoint and it finally struck me how easy it is. I decided to use the mask to create a keyhole through which you can see a scene. Here it is, still a little clunky, but it’s my first effort. 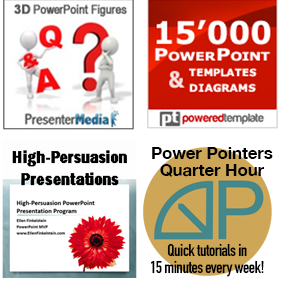 The animation in PowerPoint is much better than in the AVI file. Insert a picture, or some text, that you want to be on the back layer of the slide. To create the mask, draw a rectangle quite a bit larger than the slide. Because you’re going to move this on a motion path, you need some extra room so that the slide behind the rectangle doesn’t show. Change the fill. I used a wood-grain texture. You don’t need a border line. In the middle, add an AutoShape of another color. The color must be one that doesn’t exist in the rectangle. I used white. Actually, I used a circle and a triangle together to create the keyhole. I also added an Action Button to look like the keyhole plate in a door, placing it behind the keyhole, so I could center the keyhole properly. 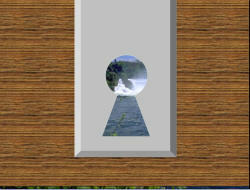 Select the objects you want to use to cover the background (in this case, the large wood-grain rectangle, the action button, and the two white AutoShapes), right-click, and choose Save as Picture. Save it in PNG format, because PNG supports transparency. Delete the objects (or, for safety, move them off the slide in case you think you’ll need to use them again). Insert the PNG picture that you saved. Center it over the slide. If the Picture toolbar isn’t displayed, right-click any toolbar and choose Picture from the list of toolbars. With the picture selected, choose the Set Transparent Color button and click the white shape. It becomes transparent! Now choose Slide Show> Custom Animation. Select the picture and choose Add Effect> Motion Paths. I suggest that you start with a preset motion path, rather than drawing your own, because it automatically starts the animation in the center of the picture, which is where it needs to be. Be prepared to spend some time fiddling with the motion path until you get the result that you want. You can achieve the same effect by using boolean “Combine Shapes” menu. You access it in ppt 2010 under the “File” tab, select “options” near the bottom of the left hand column. In the popup, select “quick access bar”. In the drop down box, select “all commands”. Scroll down to “combine shapes menu” and click Add, then OK. It will appear on your quick bar, default is under the ribbon. Make a circle and overlapping triangle for the keyhole. Select both and click shape Union Combine drop down menu. 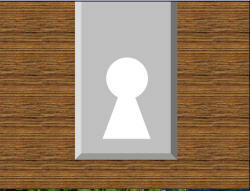 Draw a rectangle, move it underneath the keyhole (underneath, as layered in the selection pane). Select the box first, then and the keyhole and choose shape Combine. You are left with a rectangle with a keyshaped hole in it. Yes, you are right! But I wrote this tip before PowerPoint 2010 came out and it’s still useful to people who don’t have 2010 yet. I cover all of the Combine Shapes tools in a series of 4 posts, starting at http://www.ellenfinkelstein.com/pptblog/how-to-create-your-very-own-cool-shapes-with-the-custom-shapes-tools-part-i-union/. The last of the 4 posts is at http://www.ellenfinkelstein.com/pptblog/how-to-create-your-very-own-cool-shapes-with-the-custom-shapes-tools-part-iv-combine/.